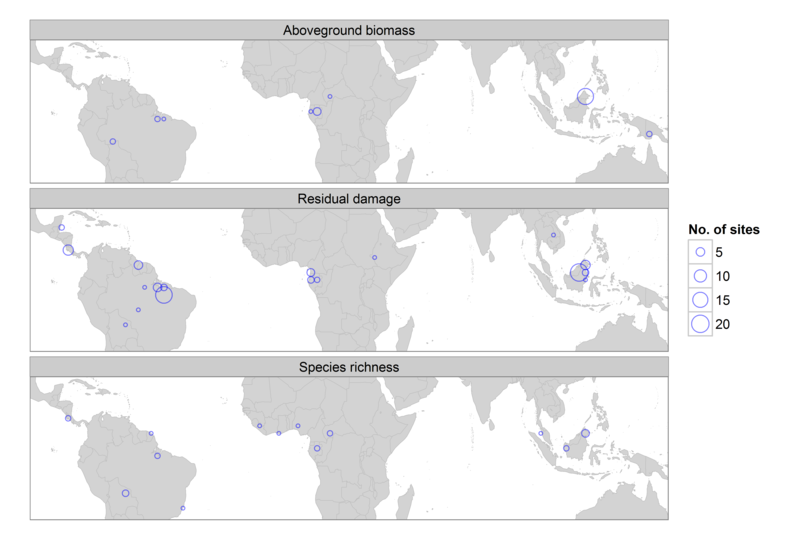 Does reduced impact logging in tropical forests benefit carbon storage and species richness? After a bit of a traumatic review process* we have just had a paper published in Forest Ecology and Management on the impacts of tropical selective logging on carbon storage and tree species richness. I’m really pleased that we finally got this work out there. If you want to give it a look you can get it here. Selective logging is one of the most widespread drivers of tropical forest degradation. As I have said before around 400 million hectares of tropical forest are now used for logging – an area twice the size of Russia. Or one hundred and ninety two and a half times the size of Wales – if that’s your thing**. High intensity logging can result in loss of animal species richness, but on the whole logging is seen as one of the least damaging human uses of tropical forests. That said, there are still concerns about its sustainability in the long-term. Poorly managed concessions commonly remove high timber volumes and do not leave enough time between logging cycles to allow forests to recover. To improve the sustainability of the practice, reduced impact logging has been proposed. This method aims to reduce negative environmental impacts by cutting lianas and vines before logging, identifying which trees to cut and mapping them before logging starts, planning the roads to be built, and training staff in methods to reduce damage to the forest. The first papers testing this method showed promising results, appearing to indicate that reduced impact logging causes lower carbon emissions when compared to conventional methods. However, many papers that have looked at the impacts of reduced impact logging failed to account for the volume of wood taken out of forests. Crucially, if this differs between reduced impact and conventionally logged sites this represents a hidden treatment, which if not accounted for can lead to faulty conclusions. Given that there are calls to pay people who use reduced impact logging as a means to reduce carbon emissions, we need good, solid science to support this policy. So, we tried to solve the question of whether reduced impact logging still reduces negative effects on residual tree damage, aboveground biomass, and tree species richness using meta-analysis. We compiled data from all over the globe, all from previously published papers. Cutting to the chase, the results for reduced impact logging were mixed. … however, this did not obviously result in reduced biomass losses, and evidence of an effect on tree species richness was poor as well. 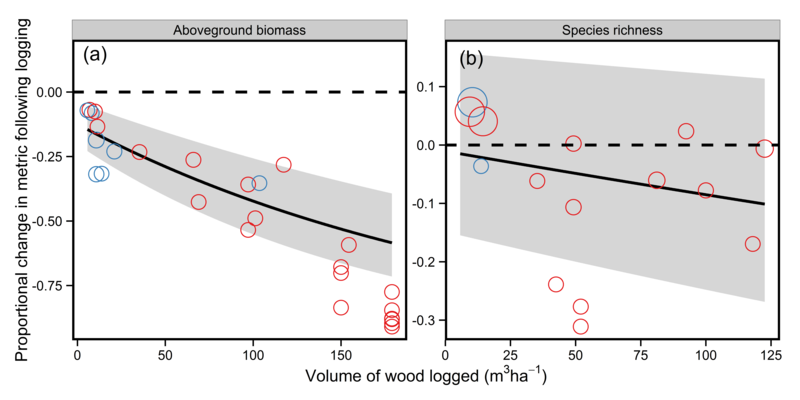 Effects of logging intensity on (a) aboveground biomass and (b) tree species richness. Reduced impact logging sites are blue points, and conventional sites are red. Note the relatively low intensity for most reduced impact logging sites. Though residual damage to trees was reduced, this didn’t cause a reduction in overall biomass loss. This may be the result of a few different factors. Firstly, residual damage is often to smaller trees so it is not necessarily that surprising that this had little effect on biomass. Secondly, we are really lacking enough data to be sure of the relationship between biomass changes and reduced impact logging. Nearly all of the data is from forests logged at low intensity so we cannot say if the slope of the relationship differs from that of conventional logging. In the case of tree species richness, the relative lack of change over a gradient of logging intensity is not too surprising. Newly logged areas richness is probably enhanced by fast growing pioneer species. However, richness is not a fantastically useful measure of biodiversity, in the future it would be much more useful to be able to say what type of species are being lost/gained not just the total number of species in a site (see the recent paper by Zuzana Burivalova and colleagues that tries to do this with bird species). So what does this all mean? Does our study mean that reduced impact logging doesn’t work? The short answer is no. The long answer is a bit more complicated than that. First we need to decide whether reduced impact logging is synonymous with low yield logging. If it is then that is fine, but we need to be upfront about this. Logging is after all mainly about timber production. However,some people have previously argued that reduced impact logging can reduce damage whilst maintaining yields. If this is true, it would represent a win-win situation. If we decide that reduced impact logging isn’t synonymous with low yields then our research question needs to change from “Does reduced impact logging cause less damage than conventional logging?” to “How do the impacts of reduced impact and conventional logging vary over a gradient of timber yields?” Generally in ecology we focus too much on using categorical x variables in statistical tests, and this case is a great example of why this approach can hold back our science (see the fantastic post by Brian McGill on this subject here). Previous studies show that animal species richness declines with increasing logging intensity and reduced impact logging causes lower losses of animal populations. As a result, a combination of reduced impact logging and reduced logging intensity may appear the best way to reduce carbon emissions and biodiversity loss from logging. However, reducing local yields may cause expansion of logging into previously unlogged areas. This mirrors the current land sharing/sparing debate on how to balance agricultural yields and food production. This debate is taking off regarding logging, and I am keen to see more work on tropical logging that acknowledges the importance of yields. As I said to someone at a conference recently, if we ignore the importance of logging yields why study logged forests? 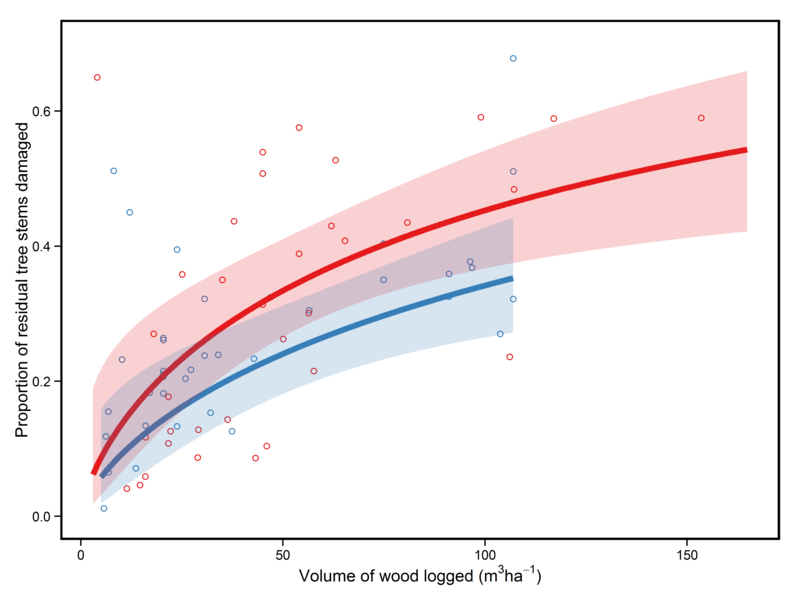 However, to inform this debate we need more powerful tests of different logging methods than we could do in our paper. One possible source of data for this are studies where logging intensity has been calculated for each sample plot used. For most of the studies I used logging intensity was only available at the site level. Getting this detail would give more statistical power to our tests and provide a more solid evidence base for management of tropical forests. Large-collaborative projects such as the tropical managed forests observatory represent a great chance to answer this question in a more satisfactory manner. *I will write more about this next week.None of the journals were to blame, just some very biased reviewers. **If any US citizens want this calculating as relative to Rhode island, I did it. It’s 1273.8 Rhode islands.